Mustangs were introduced to the United States as domestic horses in the early 1500s by the Spaniards. These horses later formed a large wild population and came to play a critical role in the building of America. Now, when they are no longer needed for labor and transport, they are sadly being mistreated and exploited. In the early 1900s, the wild mustang population was estimated to be over 2 million. Today, there are only 40,000 left in the wild and about as many in captivity in need of rescue. Caring for a wild horse is drastically different than caring for a tame one. Sadly, this often leads to mistreatment and neglect of wild mustangs in captivity. WHRC rescues horses from abusive and neglectful environments, where they are often at the brink of death. The goal is to nurse them back to health and tame and train them so they have a chance to be adopted into a loving home. 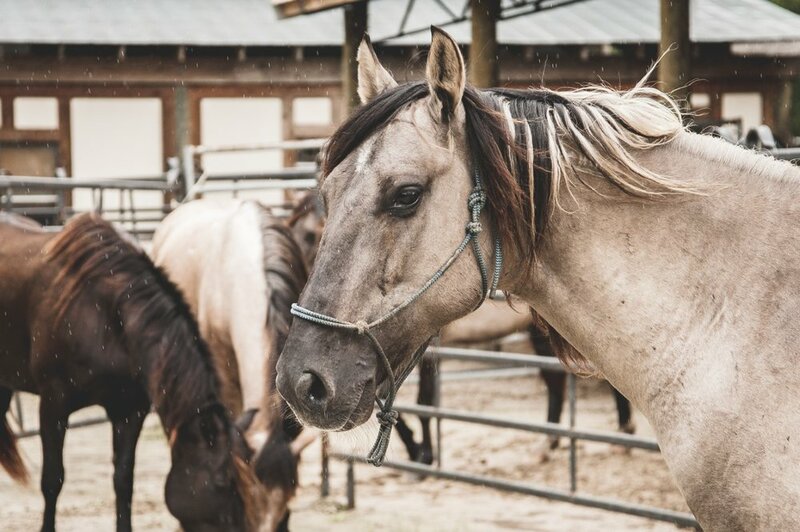 Wild horses who can't be tamed, or who are "wild at heart" as called by founder Diane Delano, will live out their days at the center where they will have the freedom to be exactly who they are. WHRC strives to create greater awareness and understanding of the wild mustang. They offer mentoring for mustang owners, hold workshops on care and gentling of mustangs, and give educational seminars on mustangs in American History.